The Knights of Columbus Council #15590 (KofC OLG), from Our Lady of Guadalupe Parish in Buckingham, PA, is proud to announce that they are holding an interfaith Pro-Life Vigil in conjunction with the Respect For Life Committee. The Vigil will be held at 6:00 PM on Saturday, May 11, 2019 at Our Lady of Guadalupe Church, 5194 Cold Spring Creamery Road Doylestown, PA 18902. Light refreshments will be offered afterwards in the Parish Life Center to encourage fellowship, build collegiality, and to promote informal discussion and sharing of information among our community. In attendance will be government officials, clergy from various local religious groups, representatives from Legacy For Life, A Baby’s Breath, and Rachel’s Vineyard, as well as others to inform and inspire attendees. The Knights Council at OLG has organized this event to raise awareness of the disturbing trend in several states that have recently passed laws allowing late term abortion. OLG is a vibrant and welcoming parish that invites everyone to join this event, especially on the eve of Mother's Day 2019, to raise awareness of the importance of life, provide insightful information, and demonstrate unity within our diverse community. The event is open to all Catholic gentlemen, Knights of Columbus, and Squires from the local community. The cost is $20/person, which includes refreshments. For information and to reserve your spot, visit https://www.signupgenius.com/go/5080945abab2da3f85-martin. The retreat is named in honor Martin Grasmeder ,who was a fine example of a Catholic gentleman. Martin was a Sacristan and a parishioner at Our Lady of Guadalupe prior to his passing in 2017. He was also an active member of the Ancient Order of Hibernians and the Knights of Columbus. Lastly, Martin served his country as part of the U.S. Army. Local KofC Council #15590 secured the rose for a stop at Our Lady of Guadalupe (OLG) parish in Buckingham, PA and a Silver Rose ceremony was held on September 8th, 2018. 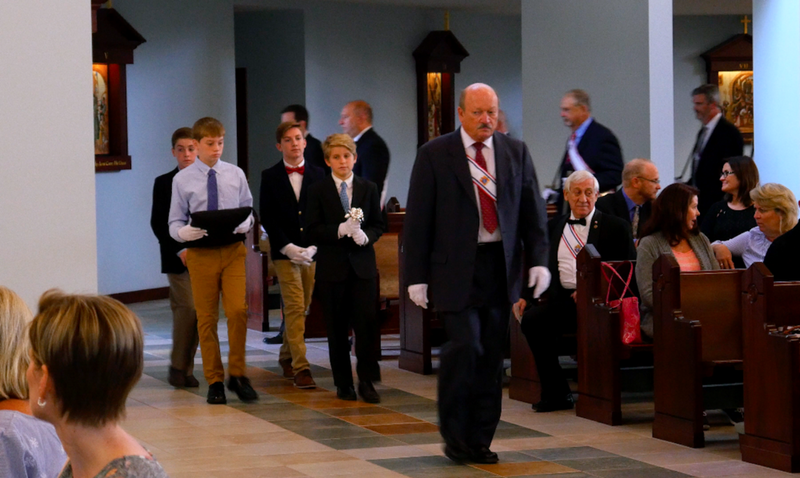 The Knights and local Squire Circle 5704 participated in the ceremony including a procession of the Rose to the Shrine of Our Lady of Guadalupe. It was an opportunity to venerate the Virgin Mary, show respect for human life and be a sign of unity among the fraternal order of the Knights. The event was attended by approximately 50 parishioners and presided over by Deacon Alessandro Giardini who also gave the homily. Many attendees said it was a moving and meaningful event with an opportunity for individual prayer over the rose afterward. They look forward to another Silver Rose Ceremony should OLG have the good fortune to be selected again in the future. Welcome to the News Page!